Blogging Friends Blog Hop – Where Does It Happen? Hello again, and welcome to the March edition of the Blogging Friends Blog Hop! This month we thought we’d stray from our usual sharing of projects, and this time show you where the projects happen! That’s right – an inside look at where the mess – er, I mean magic – happens! Every month you see the great projects that we create to share with you; do you ever wonder if our crafting areas look like yours? Well, you may get an eyeful more than you bargained for, because we’re going to satisfy your curiosity! A lot of people are lucky to have dedicated craft rooms in their homes; an entire room or space that is all their own, for crafting & stamping purposes only. I’m not one of those lucky people; I have to share my crafting area, which is actually my dining room! This is what it looks like when it’s being used for what it’s intended – dining! This picture was actually taken last night; we had family over for a birthday dinner (my youngest son is turning 18!). You can see my paper racks in the back corner..some things you just can’t move, even when company is coming over! Luckily we have an eat-in kitchen, so it’s only when guests come over that I have to remove everything off of the table, and some of the other ‘moveable’ items. My table is full, but luckily it’s neat & tidy for this picture, since I just re-loaded it after last night’s dinner! Everything has it’s place; the Simply Scored, the Big Shot, the paper cutter (which you can’t see, behind the ink pad holder), and of course the inks. I purchased my ink holder online, from a company that was going out of business, so I got a really good deal! It has 4 sides, each side holding 15 ink pads with spaces for their matching reinkers and markers. Plus, it turns on its base, so it’s really handy to use! Here you can see my paper racks; again another great bargain I found at a garage sale! (I actually saw her advertise them online, and was able to scoop them before the garage sale even happened!) 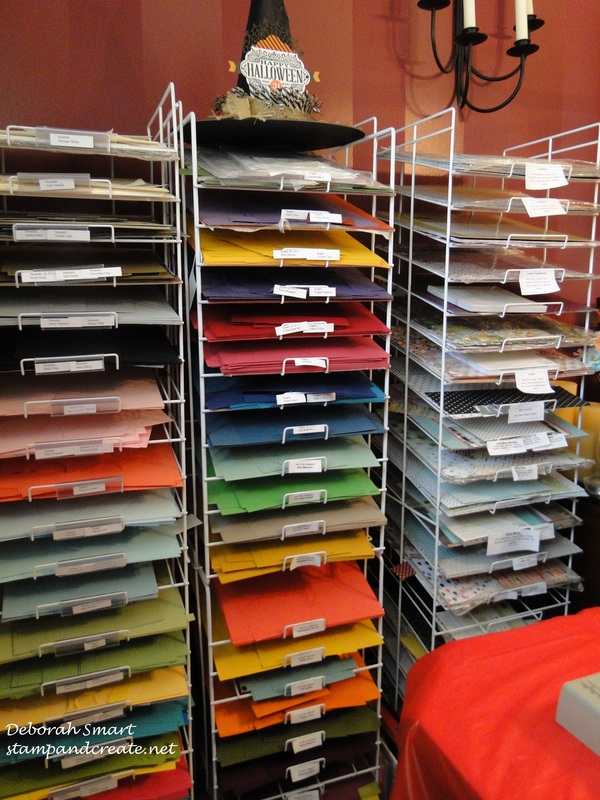 2 of the racks are for cardstock; the 3rd holds Designer Series Papers. I really could use a 4th rack (I actually had one, but sold it), but I have no room for another one! I have labels on each slot, so I don’t get my colours mixed up; the labels on the DSP slots list the name, and the colours that coordinate with that DSP. Then of course there’s the stamps…. As you can see, help is needed in this area! My DVD holder rack is completely full, which leads to the other stamp cases being lined up on the floor beside the rack, plus more in a box beside them, and even more in the drawers! The bottom drawer, which I opened for this picture, is full of punches, plus the basket on the floor is also full! I also have embellishments, ribbons and other tools in the drawers and baskets, and some extra catalogue & order forms there as well. I’m on the lookout for a deal on a bookcase that’s not too deep, that I can put all my stamp cases in, and then I can fit all my punches & embellishments/ribbons in the drawers. Oh – my dies and embossing folders don’t fit in there – they’re over here! I bought these storage boxes and holder from Ikea (I think every stamper’s favourite place to shop for storage solutions – I’ll be going back there for that bookcase I mentioned earlier!). I have one each for my Bigz dies, one for my Framelits and one for Embossing Folders. They’re getting very full, so I’m going to have to look for an alternative for these, too. 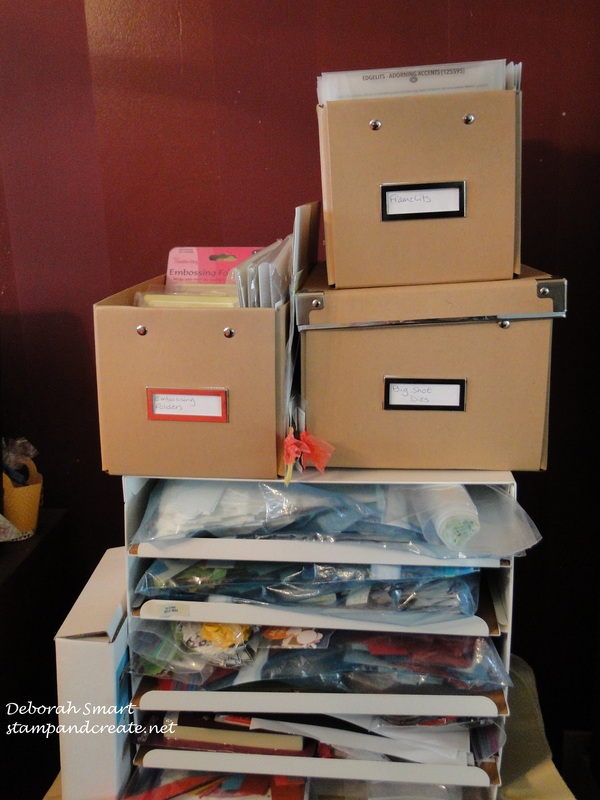 The sliding shelves underneath hold bags of cardstock and DSP scraps, extra bags for holding card kits, unfinished samples….*sigh* . I’m not a hoarder, really! I just hate to throw out a ‘useable’ sized scrap! I put a plastic table cloth over the wood table, then I have my self-healing cutting mat (for any impromptu hand cutting with an exacto knife I may do). Then of course is my Stampin’ Up! Grid Paper; I never stamp without it! I love it not just for keeping the area clean and stamping off, but I do actually use the grid lines for centering, for keeping my card straight, and helping me stamp straight! It’s great for measuring when I’m cutting ribbon pieces for card kits, and for creating layers for cards. I also always have my Stampin’ Scrub and Stampin’ Mist right beside my stamping area; I believe in always cleaning my stamps right after I use them. After all, they are a business tool that I’ve invested in, so they have to be in good condition. Then in front of me are my clear blocks, my basket with assorted adhesives, and my Sponge Daubers (some of them, anyway!) I bought the dauber case a long time ago; you can probably find them on Amazon if you’re looking for them. I actually have to pull out a second one, as this one is full, and I have more daubers in little bags everywhere! I have the label on the top of the case with each colour name, and I also put the colour name on the dauber itself, as often more than one dauber is being used at a time (especially during classes), and I don’t want them to get mixed up, or inked in the wrong colour. I forgot to take a picture, but I have 1 more little table – it’s actually a TV tray – does anyone use those anymore? – that I have my embossing powders on, and another basket of embellishments; and any other flotsam that happens to be floating around, and gets in my way! When I’m holding a class, I clear off the majority of the tools – I set up another table to hold what we need to use – and set up stamping spots for everyone. The important thing is that we all have fun, get inky and get creative! Well, that’s the look at my craft area! Are you feeling good about your area, now?! 🙂 One of these days, we will have the money to re-do our basement, and I will have a dedicated area where I can keep all of my supplies as well as hold my classes, but for now, this will do! I’d love to hear your comments, and please share any storage tips that you have found work for you! 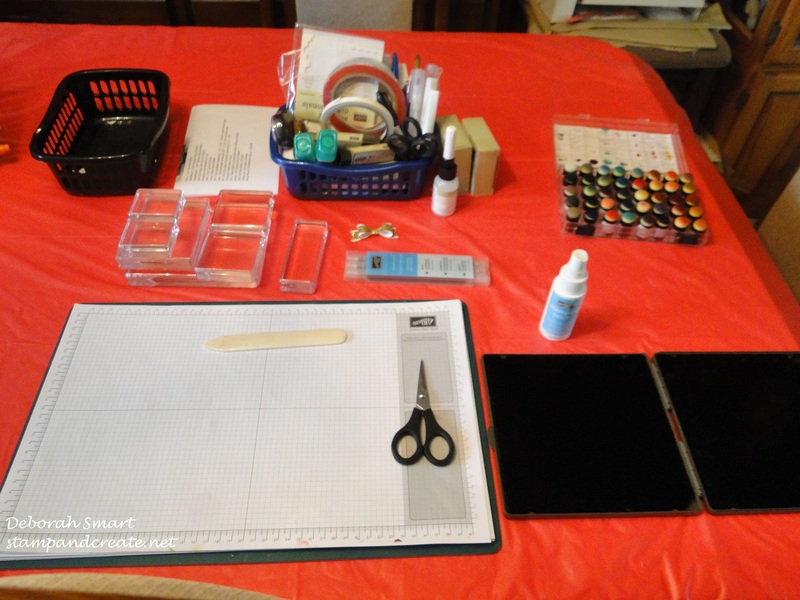 Now you can head over Jessica Mink’s blog by clicking on the button below, and have a look at her crafting space! I can’t wait to see everyone’s spot – I’m curious to see all the layouts and storage finds. Thanks for spending time with me today – have fun hopping around! Next Next post: My First Hosted Sketch Challenge! Wow you make good switch overs! both events look like fun! We always have fun at the dining table!! 🙂 Thanks for visiting my blog today! 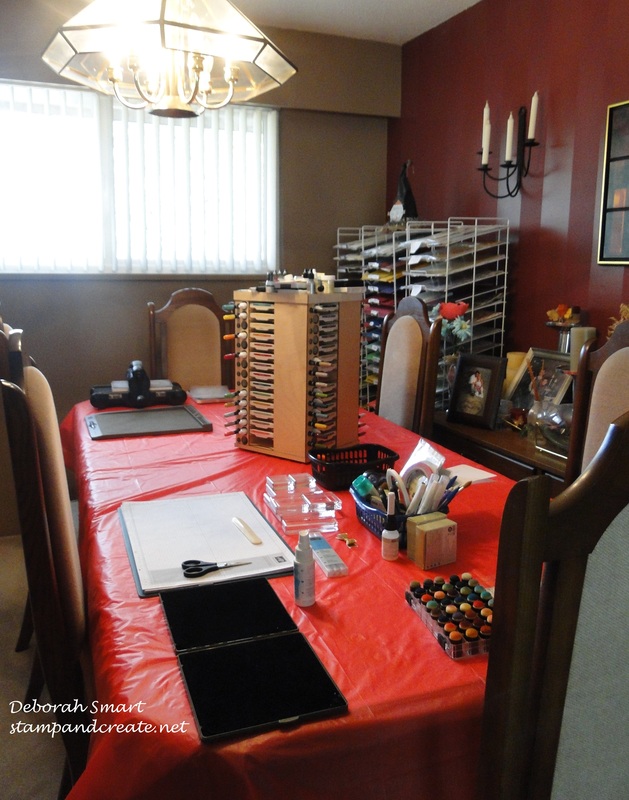 Thanks for letting us “visit” your stamping space, Deborah! 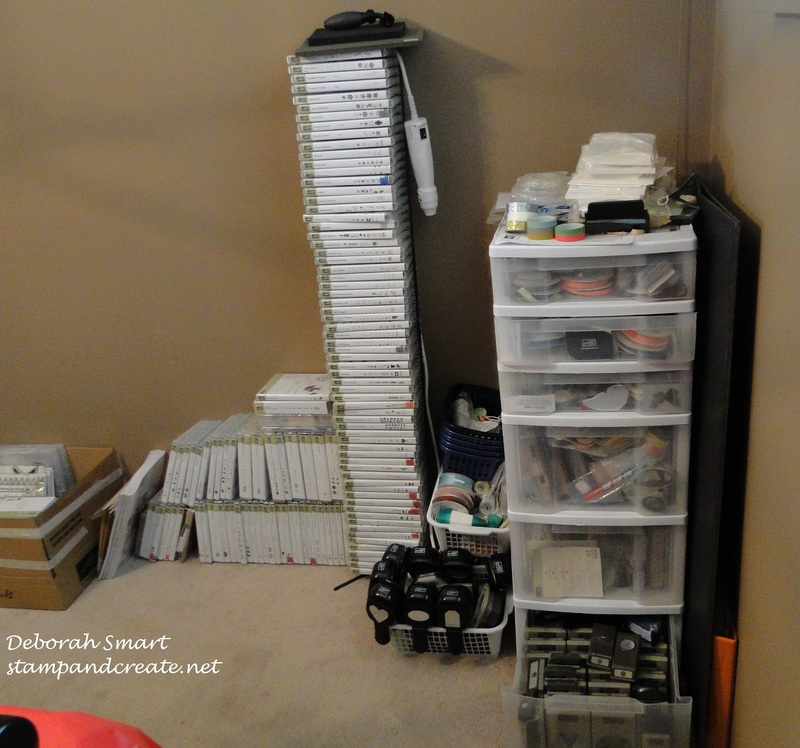 I am super envious of your paper storage! Paper is my biggest storage struggle 🙂 And, I too am outgrowing my DVD tower that holds my stamp sets, lol. LOL – the struggle is real for us avid stampers, isn’t it Danica?! There’s always more stamps, papers, embellishments – more of everything – to buy! I love your space Deb! When can I come over and stamp and have dinner? 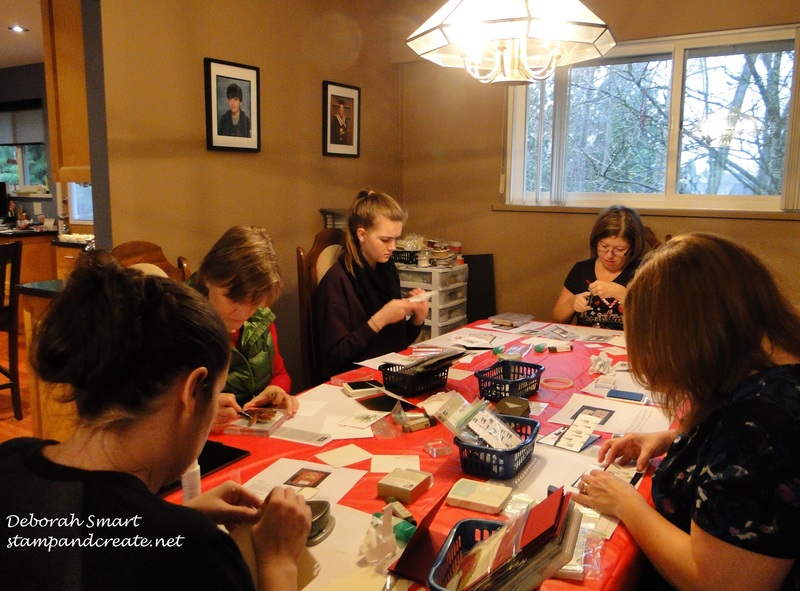 You know, I’d feel right at home here – I craft in my dining room too! Libby, you’re welcome to come dine & stamp anytime!! 🙂 Hey – maybe that’s a new theme night! We work with what we have, right? Deb, my dining room looked like that for 2 years also, and my family got used to eating in my “craft room”!! TFS! Isn’t it funny, Michelle? The dinner conversation can take some strange turns, when suddenly someone notices a sample, or realizes that the stamp cases are not DVD’s! Would love to have the paper racks! I haven’t been lucky enough to find them online or at a yard sale Wait to go! 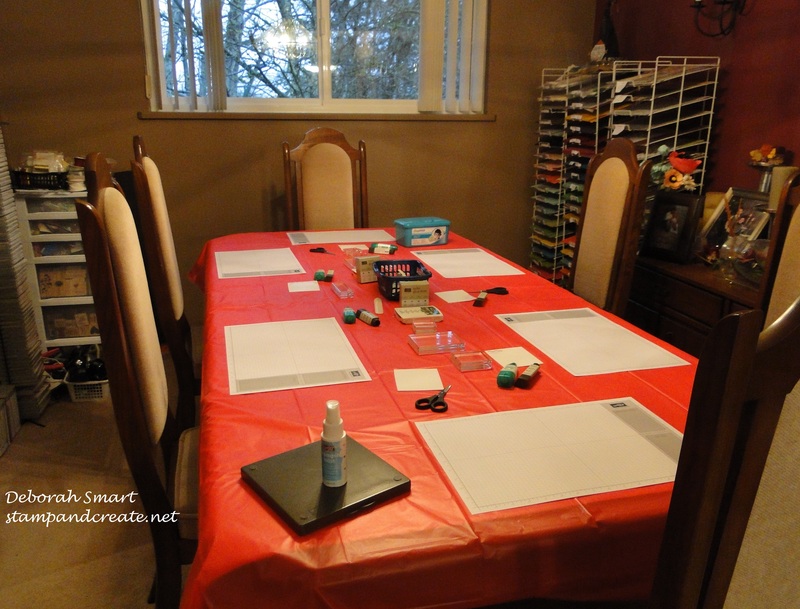 I use to craft on our dining table but as my craft supplies grew, I had to get a 6′ table and take part of our living room. So, its an organized mess for me. I love how you can switch over from crafting to a dinner party. 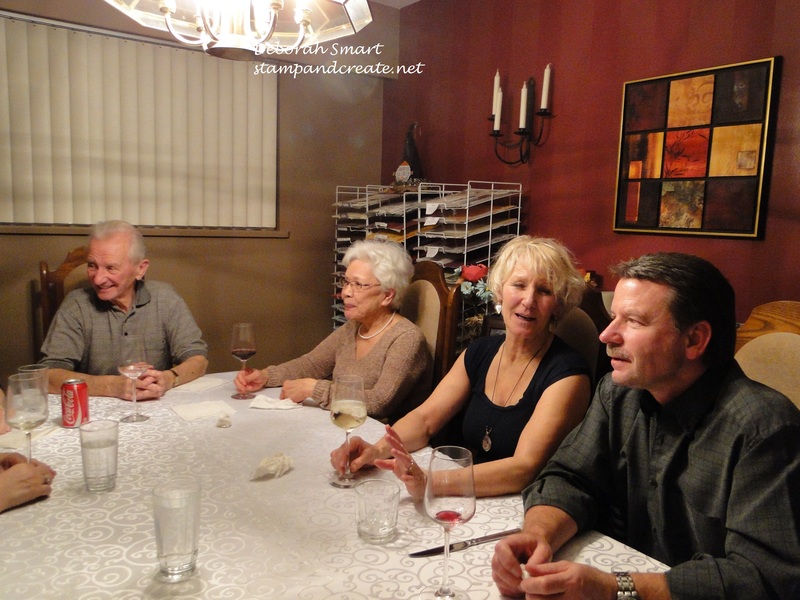 If I have more than 6 people, then I pull out the extra 6′ table, Lorene! Sometimes I have to get my hubby to borrow one from his work, too 🙂 It’s all good – thanks goodness we have an eat-in kitchen! I really love how you keep everything organized even though it’s spread out and around. I too hold class at my kitchen table. It works perfect for me. We make do with what we have …right?! I am loving that dauber case, I’ve been seeing them all over this hop…..I must get one!!! Thanks for sharing! whoops…I entered my email twice:) sorry about that! You’re right – we have to make do with what we have! And it works! 🙂 Thanks for visiting! Great double use of space Deborah! Save some cake for me. It’s great that you have space to stamp, even if it does double as a dinner table. We all know it really wants to be a stamping table instead.